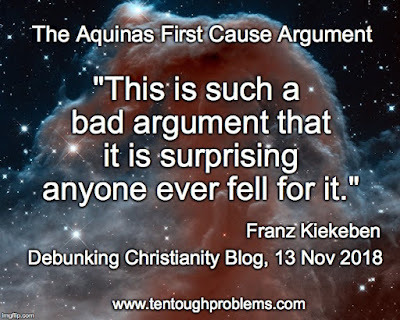 There are quite a few things wrong with the first cause argument, but the worst thing about it — Aquinas’s attempt to show that the chain of efficient causation cannot extend back to infinity — is ignored by most critics. The claim that there cannot be an infinite causal regress is often disputed, of course, but Aquinas’s bizarre reasoning to the contrary is usually passed over — maybe for fear it would just be confusing to readers. Whatever the case may be, I think it’s worthwhile to be aware of it, especially given that Aquinas’s old argument is still touted by many. Translating from medievalese, this just says that if there is no first cause, then neither will there be a second, third, and so on — and thus no ultimate effect. But if the chain extends back infinitely, then obviously there is no first cause; there will always be others before any that we care to consider. Therefore, if the chain extends back infinitely, there will be no ultimate effect! This is such a bad argument that it is surprising anyone ever fell for it. 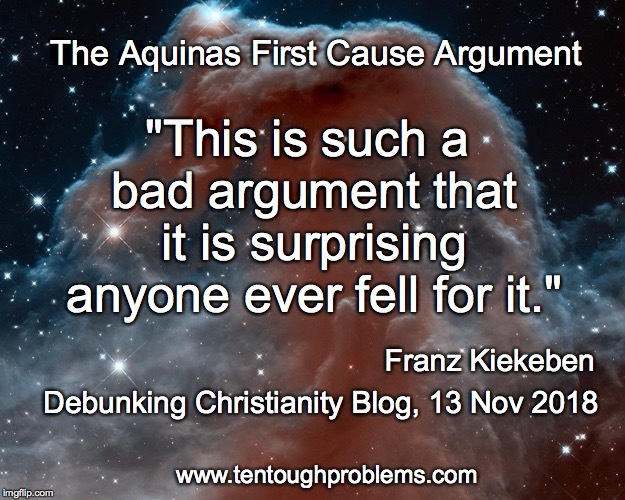 Aquinas is simply confusing the existence of a cause that he calls “the first cause” with its property of being first. That is, what we might label the “first” cause cannot be missing from the chain, otherwise the “second” cause would also be missing, and so on. Given Aquinas's assumptions, that much is true. But it does not follow that this event that we're calling “the first cause” cannot have a predecessor. If the chain of causation is infinite, then there is no first cause. But no link in the chain will be missing on account of that. One can also understand Aquinas's mistake this way: he is either equivocating or begging the question, depending on how what he refers to as the “first” cause is interpreted at the beginning of the above passage. He is begging the question if by the “first” he means the cause that has the property of being first, for then he is simply assuming the very thing he is attempting to demonstrate. If, on the other hand, he is merely naming a particular cause in the chain the “first”, then he equivocates when he later uses the same term to mean the cause that has the property of being first. Aquinas therefore has failed to show that the chain of causation must have had a beginning. As a result, his entire argument falls apart.